It is readily soluble into a wide range of organic solventes such as alcohols, esters, ketones, chlorinated solvents and aromatic hydrocarbons. It is also miscible in all proportions with water. 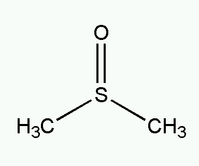 Dimethyl sulfoxide is a by-product of wood pulping and is frequently used as solvent in a number of chemical reactions. In particular DMSO proved to be an excellent reaction solvent for SN2 alkylations: it is possible to alkylate indoles with very high yields using potassium hydroxide as the base and a similar reaction also occurs with phenols. DMSO can be reacted with methyl iodide to form a sulfoxonium ion which can be reacted with sodium hydride to form a sulfur ylide. The methyl hydrogens of DMSO are somewhat acidic in character (pKa=35) due to the stabilization of the resultant anions by the sulfoxide group. One of the leading suppliers of DMSO is the Gaylord company in the USA. DMSO was discovered in 1867, but was not used commercially until after WWII. Other than its use as a solvent, both in organic synthesis and industrial applications (polymer chemistry, pharmaceuticals and agrochemicals), DMSO also makes a very good paint stripper: it is able to remove many paints from both wood and metal in a small amount of time. It is thought to be much safer than many of the other chemicals used as paint strippers, such as nitromethane and dichloromethane. In organic synthesis, DMSO is used in the oxidation reactions, the Pfitzner-Moffatt oxidation and the Swern oxidation. DMSO is also employed as a rinsing agent in the electronics industry and, in its deuterated form (DMSO-d6), is a useful solvent in NMR due to its ability to dissolve a wide range of chemical compounds and its minimal interference with the sample signals. In cryobiology DMSO has been used as a cryoprotectant and is still an important constituent of cryoprotectant vitrification mixtures used to preserve organs and tissues. It is particularly important in the freezing and long-term storage of Embryonic stem cells, which are often frozen in a mixture of 10% DMSO and 90% fetal calf serum. Use of dimethylsulfoxide in medicine dates from around 1963, when a University of Oregon Medical School team, headed by Stanley Jacob, discovered it could penetrate deeply through the skin and other membranes without damaging them and could carry other compounds deep into a biological system. In fact, it is possible to perceive the taste of DMSO (onion or garlic-like) in a matter of seconds after contact with the skin. In the medical field DMSO is predominantly used as a topical analgesic, a vehicle for topical application of pharmaceuticals, as an anti-inflammatory and an antioxidant. It has been examined for the treatment of an extraordinary number of conditions and ailments. The FDA has approved DMSO usage only for the palliative treatment of interstitial cystitis. Morover it is commonly used as a liniment for horses, although its use in humans is controversial.